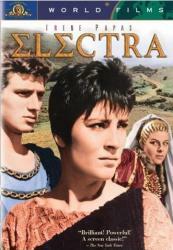 Drama, USA/Greece, 1962, 111 min. Synopsis A powerful rendering of the tragedy of Elektra by Euripides. The film begins with a summary treatment without dialogue of the action of the preceding play in the trilogy, The Agamemnon, in which the wicked Queen Clytemnestra and her lover Aesgisthes murder her husband Agamemnon upon his return from the Trojan War.